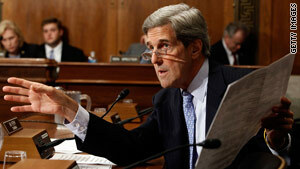 Sen John Kerry, D-Massachusetts, had requested a visit in December, Iran's semi-official Fars news agency says. Tehran, Iran (CNN) -- An Iranian parliamentary committee has denied a request by U.S. Sen. John Kerry to visit Tehran, according to reports from Iran. Kerry had requested a visit in December, Iran's semi-official Fars news agency reported. The request was discussed and rejected by Iran's Foreign Relations Committee of the Parliament, according to Tabnak, a news Web site linked to past Iranian presidential candidate Mohsen Rezaie. It is unclear if this committee has the final say on whether Kerry can visit Tehran. Kerry, D-Massachusetts, is chairman of the Senate Foreign Relations Committee. The United States and Iran ended diplomatic relations in April 1980, following Iran's Islamic Revolution. President Obama has made gestures toward re-establishing a dialogue with Iran, but in recent months, the Obama administration has sharpened its tone because of concerns about Iran's nuclear program. Tehran says the program is for peaceful purposes, but the United States and other Western nations fear it wants to acquire nuclear weapons.